The Amsterdam Brewery was buzzing with excitement on Thursday August 23rd. 300 tickets were pre-sold before the event began and when we arrived the rush line was out the door, around the corner and at least two blocks down. One man waiting in line said that he had never seen it so busy. After the fact, we learned that this screening of Beasts of the Southern Wild was the Open Roof Film Festivals largest attendance in three years! Before the film began, a great Canadian band, Bruce Peninsula, performed live. Phil M., a frequent Open Roof Festival moviegoer, said, “I thought that most people would have come out to see the band, but most are actually here to see the film.” Prior to the screening most of the patrons interviewed weren’t actually sure what the film was about, but they were in attendance because what they had heard inspired them. After the screening I looked around at the tear filled audience. This film brings about an emotional response in everyone. Neil, a band member of Bruce Peninsula, said, “I was on the verge of crying the entire time but the movie was saying, “don’t cry you sissy,” so I couldn’t.” He continues, “I felt like I was in a whole other world that I couldn’t live in in my own life. 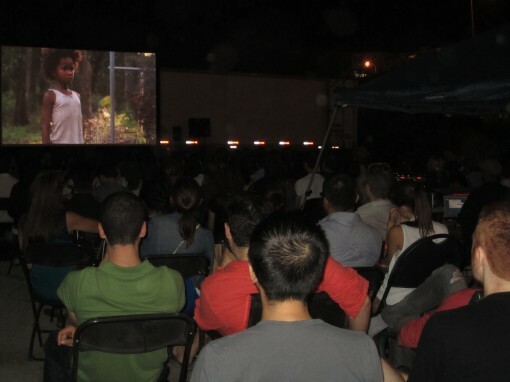 This screening of Beasts of the Southern Wild at Open Roof Festival hosted people from 11 to 65 years old. It’s a rare and beautiful moment when one movie can draw such a wide audience and lead them to the same conclusion. I grew up in a small community just north of downtown Toronto, Canada. We used to call it “The Bubble” because we were so sheltered from the rest of the world. Similar to Beasts of the Southern Wild, everyone knew everyone and those who weren’t a part of “The Bubble” were seen as a threat. I have worked on some of the top reality television shows in Canada and the U.S.A. but up until now I have not had the opportunity to experience such an incredible unity between a production and an audience that I have seen with this film. One man in attendance at the Open Roof Festival asked me if I’ve ever been to New Orleans. The great thing about this film is that even thousands of miles away in Canada, every single person who watches the movie can find a way to make it relatable to his or her own story. For more Festival photos, check out Open Roof's Facebook album. Sam Schleifer is a Beasts of the Southern Wild Outreacher based in Toronto, Canada.